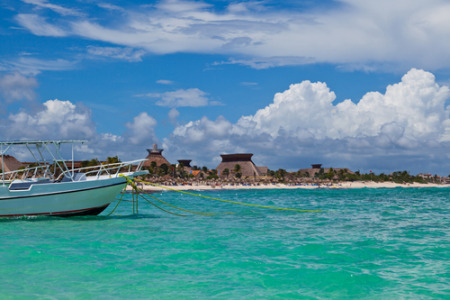 Riviera Maya holidays take you to a purpose built resort on Mexico's Yucatan Peninsula. Built to offer a high standard of luxury along a stunning sun-bleached beach, holidays in Riviera Maya have wide appeal. The palm studded beach slopes gently into the clear Caribbean waters providing ideal conditions for paddling children and weak swimmers. Water sports are available for the more active holidaymaker and the fertile reef is very rewarding for scuba divers and snorkellers. Although there is a rainy season from June until September, holidays to Riviera Maya can be taken at any time of year as the weather is always hot. We have a number of cheap Riviera Maya holidays that offer great value particularly for families. All-inclusive hotels are ideal when travelling with constantly hungry and thirsty children. Our low cost Riviera Maya holidays can be as laid back or as active as you wish as there is a range of water and land based activities and various sightseeing opportunities. Shopping, though limited, is adequate with shops for gifts and souvenirs as well as holiday essentials. Nightlife is fairly relaxed with hotels providing evening entertainment. If you are looking for a relaxing break in idyllic surroundings you may find that our Riviera Maya holiday offers will fit the bill. Since bargains such as these fly from the shelves, it is best to book early in order to avoid disappointment. For further details and to view our latest Riviera Maya holidays deals, please use the search facility.